In the days since I’ve written, I’ve made it from Bloomington, Indiana to near the Missouri/Kansas line, a day more than the map above shows. My average daily mileage has gone up considerably, with two days in the 90’s and one full century (100 miles) last week. This isn’t because it’s getting flatter—that hasn’t happened just yet—it’s because my schedule demands it, and I’m getting stronger. The last day in Indiana and the two days it took to cross Illinois (I’m really proud of that!) were three of the hardest days so far, unfortunately all in a row. I’m clearly now in the endurance part of the journey, and honestly a lot of it, or maybe just Illinois, really bites. This is not the Saturday fun rides in the Marin Headlands kind of riding; it’s sun-baked, middle-of-nowhere kind of stuff where back roads that can suddenly become impassable and the slightly-less-back roads have angry drivers that get their jollies out of scaring cyclists. One of those images below shows how a road I was on in Illinois became a steep hill of sand… with an unusually aggressive dog at the top. That day turned from a planned 80 miles to 100 miles just from re-routes and on-the-ground problem solving. I think that’s the real stuff of bicycle touring, but it’s especially hard when it’s relentless. Can I say it again? Illinois was simply the worst, but really it’s because I had so many problems with drivers in just two days. Early on, a semi truck probably purposefully blew by me at 60 mph, less than 18 inches from me, even when the trucks immediately before and after him moved safely over. I didn’t have the chance to understand what had happened until it was over, but it’s still frightening to remember. There was also a close call with a probably oblivious minivan driver. I’ve had some other close calls as an urban cyclist before but never that close or at those speeds. On the second Illinois day I was introduced to a whole new level of driver aggression. Just after lunch, on a lightly-traveled road (should be ideal for me) when there were no other cars in sight, I was startled by a horn, blown directly behind me. Then a pick-up truck accelerated past me, nearly making contact. As the driver passed, I saw his head jerk to look in the rear-view mirror to collect his reward: my reaction. I don’t react by policy, or at least not with anger. A few miles down the road, I got an unrelated flat tire. I pulled off onto a side road, found the puncture in the tube, and patched it. But the patch didn’t hold air pressure. I broke the valve on my first spare tube and pinched the second installing it, puncturing it too. Both re-patching the original tube and patching the third tube didn’t work either, and I managed to snap two of my three tire levers in the process. During that hour-long fiasco, four drivers pulled up to ask if I needed help, but since I wasn’t yet out of options, I said no thanks. (Let’s not forget that there are still more good people in the world than wackos!) 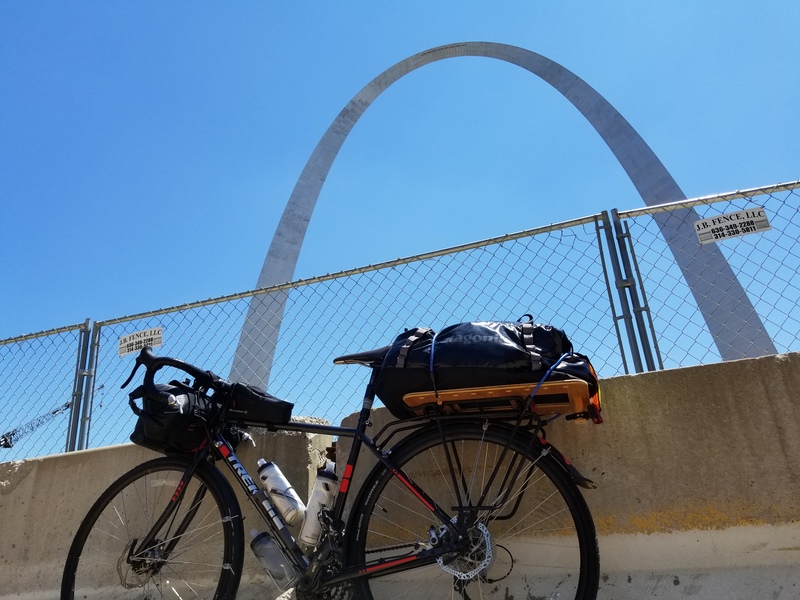 But then I really was out of good options, so I had to ride 26 miles to the nearest bike shop on the outskirts of St. Louis on my back rim plus a flat tire for negligible padding. Twenty-one of those miles were on a gravel bike path (ouch). The other five were on a road, where somehow I managed to attract yet another wacko pick-up, again alone on the road save for me, who tried to scare me with his horn. He did give me proper space but he made some sort of threatening gesture with his arm out the window to go with the horn. We were both just passing one of many “Share the Road” signs. It all worked out at the bike shop, with new tires, tubes, spares, etc. And somehow, no damage to my rim! The guy there stayed late just for me. 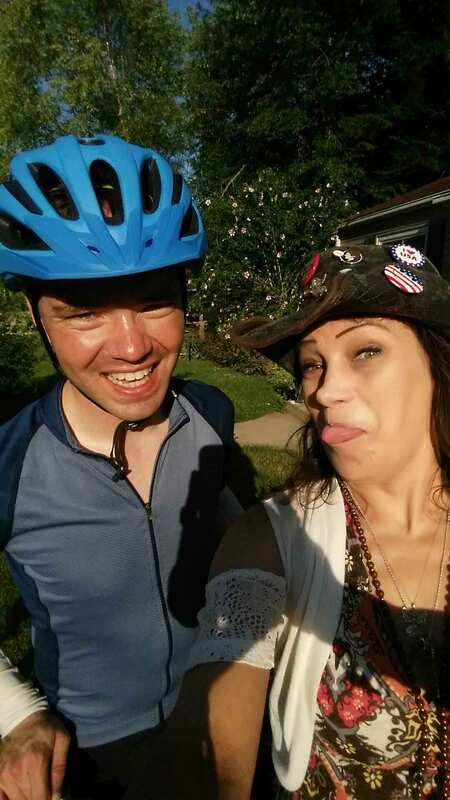 And for what it’s worth, he said I was the second person with that story (cross-country ride, 20+ miles on a flat tire,…) to come in that day! Regarding my homemade back rack, he said “Well, you aren’t kidding around.” Later he also volunteered that he’s seen enough cross-country riders over the years that he can practically diagnose their mental and physical health on sight. He said I was easily in the top 3%, so of course I’d make it all the way. And after that day! After that, it was full speed out of Illinois and into St. Louis, through some dodgier areas that I wished I had traversed when the sun was higher in the sky. I earned seeing that arch! Please don’t think I’ve forgotten, among all the goings-on that several drivers intentionally put my life in danger. It haunts me. Part of why I felt the need to explain a single day in such detail, above, is to show you how confusing this is for me. I’ve met many dozens of truly kind people along the way, but a few monsters too, and I’m not sure what that means for me yet. I have so many questions. If I have a sign on my back that only the wackos see, what does it say? “I think I’m better than you?” “I’m a coastal liberal elitist?” “I’m vulnerable so please mess with me?” Do more people see that sign too and not act? I have no idea, but whatever it is, it’s a snap judgement on their part, and surely wrong. I also admit that part of why this has been so hard to work through for me is that I have some snap judgements about them (the wackos) too. Then, at what point do I call this? When is the risk to my life unacceptably high? I’ve worked harder for this than almost anything else ever. It’s man against nature, survival, and all manner of strength-building. But what does it mean if my most dangerous enemy is from my own team: other people. Other Americans, other Midwesterners even. I don’t have any answers here, but I will say that whatever threshhold I have for “this is too dangerous” is closer than I ever imagined it would be. Everyone I’ve met who has ridden cross-country says they’ve come back with newfound hope in human nature. I don’t think I can reach that same conclusion, or at least not without just as much nuance as I’ve ever known there to be. After a night to recover in St. Louis, I decided to be pokey for a day and I only went 65 miles to Washington, MO. I was feeling particularly vulnerable somewhat demoralized about bad people. Along the way I was honked at, not nicely, three times by pick-up trucks, twice when I was all the way to the outside of a generous ten-foot margin, so apparently even the sight of a bicycle is enough to make some people freak out just as much as dogs do when they see bikes. The majority of the rest of the state would be one big bike path, which offered me safety while I processed what I should do: to stop or to keep going. 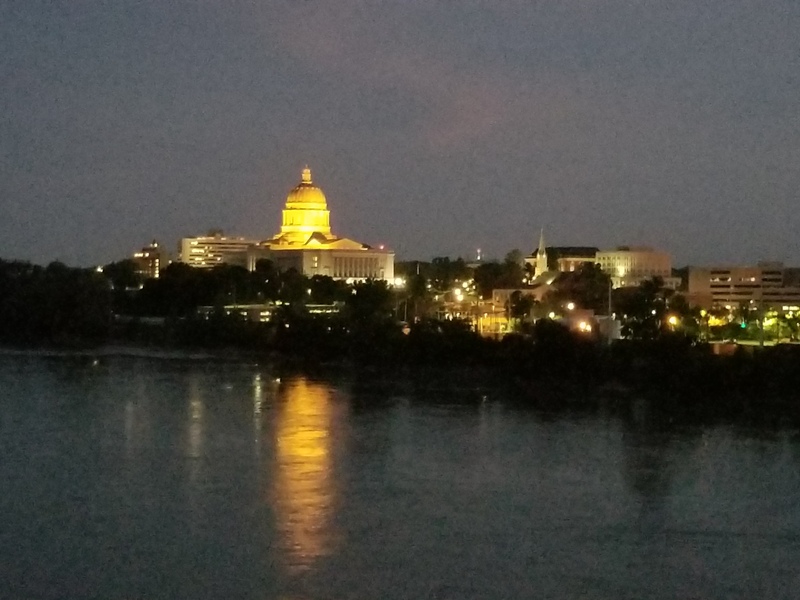 I took a much-needed rest day in Jefferson City, the capital, halfway-ish through the state. At 43K people, it’s the last city of any size I plan to see for the next 800 miles before Denver. “Jeff City”, as they call it, was great. I got my bike fixed again… remember those brand new tires? They each had a flat spot, and neither I nor the mechanic there could “seat” them properly on the wheel, or perhaps they were just defective, so I had to buy a third set of tires that, hooray!, are finally both round. (It’s been fewer than half of my total riding days that I’ve had two round tires.) It makes a big difference! 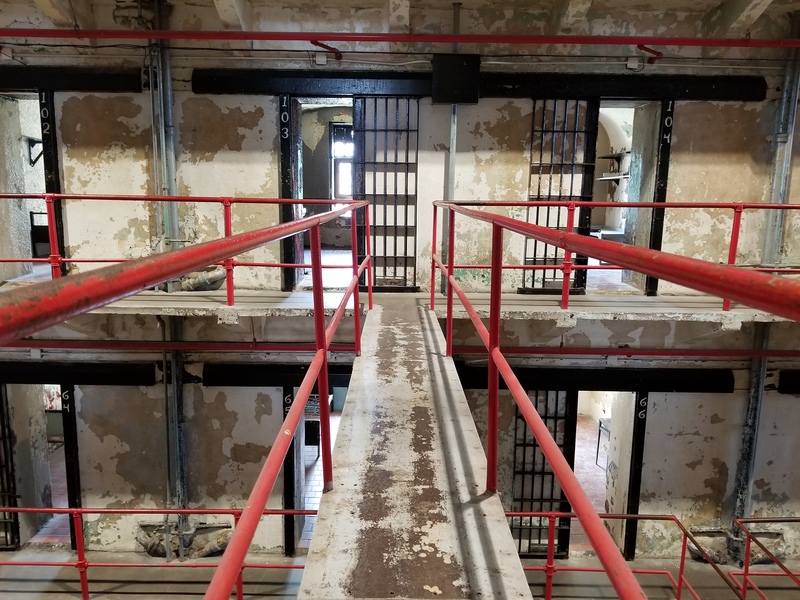 I also toured the capitol building, and I toured the now decommissioned Missouri State Penitentiary, where stories of how prisoners have been treated in our own country made me revisit that whole human nature problem. They actually had dungeons where they used to lock people up for sometimes years with no light. Eleven continuous years and the blindness it caused went to the man who tried to start a union in the prison workshop. The rest of my time in this state has been really great. The Katy Trail follows the old Missouri-Kansas-Texas (a.k.a. “MKT”, a.k.a. “KT”, a.k.a. “Katy”) Railroad line mostly up the Missouri River. It’s the first and still the longest rails-to-trails project in the U.S. and they did a great job posting signs everywhere Lewis and Clark camped and what they did that day. It was easy to imagine following them. Next up, Kansas, where I hear the drivers aren’t as crazy? I am…unabashedly pleased that you are even considering quitting. I am NOT commenting one way or the other but…having watched you in undergrad, then again to the next level in grad school, true “quitting” was always a closed door for you, even at the cost of your health and/or sanity. So as backwards as this sounds, I’m proud of you, my friend, for considering your health and the risk to your life as weighty enough things to potentially stop this trip over. Either way, it sounds like you are growing in a multiple of ways on this trip. Pretty awesome, my friend!